The Early Egypt Gallery (Room 64) has undergone a full-blown refurbishment with new themes and displays throughout. Here Renée Friedman explains some of the highlights of the gallery including the new acquisitions from the site of Jebel Sahaba and the return of the popular virtual autopsy table allowing a deeper look into the Gebelein Man. 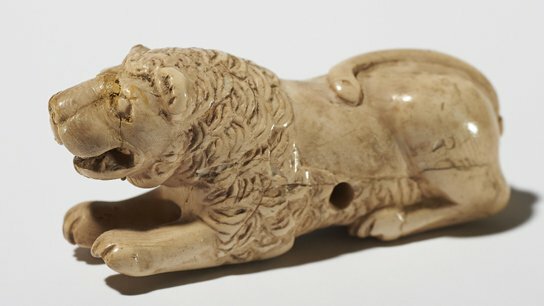 Ivory gaming piece (EA 64093). Catering for the royal afterlife, board games and playing pieces for Mehen, the snake game, were some of the objects placed in the tombs of the First Dynasty kings. What started off two years ago as a rearrangement of a few cases in the Early Egypt Gallery (Room 64) to highlight new acquisitions has, thanks to the generosity of Raymond and Beverly Sackler, developed into a full-blown refurbishment with new themes and displays throughout. This has also given us the opportunity to integrate some of the recent research into the early, formative periods of Egyptian civilisation and present our better understanding of it. Ancient Egyptian civilisation is the product of more than 5,000 years of development. The gallery focuses on the earliest, prehistoric, phases of this development from 8600 BC to 3100 BC when Egypt unified to become the world’s first nation state. It also highlights the advances in ideology and technology during the First and Second Dynasty that paved the way for the Pyramid Age of the Old Kingdom. To illustrate these stories we have created new displays of objects long held in the collection as well as a selection of materials only recently acquired. Map of cemetery 117 at Jebel Sahaba. The red dots indicate those who experienced a violent death. Click on the image to view a larger version. Among the most exciting of the new acquisitions are the materials from the site of Jebel Sahaba, now in northern Sudan, which were donated to the Museum by Dr Fred Wendorf in 2002. Excavating here in 1965–66, as part of the UNESCO-funded campaign to salvage sites destined to be flooded by the construction of the Aswan High Dam, Dr Wendorf found a cemetery (site 117) containing at least 61 individuals dating back to about 13,000 years ago. This discovery was of great significance for two reasons. First, as a designated graveyard, evidently used over several generations, it is one of the earliest formal cemeteries in the world. Prior to this discovery, only isolated graves, or clusters of up to three bodies had been known within the Nile Valley. But perhaps even more significant, of the 61 men, women and children buried at Jebel Sahaba, at least 45% of them died of inflicted wounds, making this the earliest evidence for inter-communal violence in the archaeological record. Chips and flakes of chert, the remnants of arrows or other weapons, were found mixed with and in some cases still embedded in the bones of 26 individuals, while cut marks were found on the bones of others. A special case displays two of the unfortunate victims (Burials 20 and 21) and the remains of the actual weapons that killed them, recreating the burials as they were found. This is the first time these skeletons have ever been publicly shown. Both were adult men, buried together in the standard flexed position, on their left side, on their left side, head east, facing south. A total of 19 weapon fragments were found in and among the bones of Burial 21 by the original excavators, including one still lodged in his pelvis. However, modern conservation of the bodies in preparation for the display has now made it possible to see at high magnification many more tiny chips. Ongoing research is also studying the velocity and directionality of the arrows and weapons based on cut marks and other micro-traces on the bones, potentially allowing us to recreate the lethal raid. Clearly, the conflict was brutal and seems to have been fairly constant, as healed injuries have also been observed. The reasons for all of this violence most likely comes down to climate. The Ice Age glaciers covering much of Europe and North America at this time made the climate in Egypt and Sudan cold and arid. The only place to go was to the Nile, but its regime was erratic: depending on the exact dating, the river was either high and wild, or low and sluggish. Either way, there was little viable land on which to live, and resources must have been scarce. Competition for food may well have been the reason for the conflict as more groups clustered around the best fishing and gathering grounds and were unwilling or unable to move away. Two other cemeteries found by Dr Wendorf in the vicinity suggest that several other social units, or small tribes, also considered this area their home and this may have caused friction. However, the bodies in the other cemeteries show no evidence for the sustained violence seen in Cemetery 117, suggesting that this group was either very unlucky or that the cemetery was allocated specifically for those who died a violent death. As more research is carried out on the unique collection now housed in the Museum, we will certainly learn more about life in those precarious times. Of course, the Jebel Sahaba people were not the only victims of violence. The newly refurbished gallery also features the return of the popular virtual autopsy table allowing a deeper look into Gebelein Man and his unfortunate end. For the actual remains of this remarkably well preserved natural mummy, the new display aims to recreate his grave as accurately as the surviving records allow. Sir Wallis Budge, Keeper of the Egyptian Department from 1894 to 1924, claims to have witnessed the excavation of Gebelein Man in 1899 and relates that the grave was covered by stone slabs and the body was surrounded by pots and other objects. Simulating some stone slabs was no problem, but it proved impossible to determine which items came specifically from his grave. Those now accompanying him do at least come from Gebelein and date to about 3500 BC, the time we think that Gebelein Man lived. This was a period when several regional centres were beginning to vie for power and territory, leading ultimately to the unification of Egypt some 400 years later. Violence no doubt played a role in this process (as made clear by the intricately carved Battlefield palette, soon to be reunited with its mending piece on long term loan from the Ashmolean Museum, Oxford) and the stab wound in Gebelein Man’s back may mark him as an unfortunate victim of his times. This period was not all murder and mayhem. Other themes in the gallery include how climate change has preserved for us a glimpse at the very beginnings of ancient Egyptian civilisation in the lives of herders living in what is now the Sahara desert from about 8600 BC until the drying climate forced them to the Nile. There they adopted farming, setting in motion the social and technological developments that led directly to the advent of Dynastic Egyptian civilisation in around 3100 BC. The gallery includes displays illustrating afterlife beliefs, early gods, the first writing and technological innovations, as well as a look at the sumptuous afterlife of the First Dynasty kings. Ceramic mask recently found at Hierakonpolis, displayed in cast in Room 64, courtesy of the Hierakonpolis Expedition. Working on the gallery, through the kindness of Tom and Linda Heagy, I have also been able to integrate some of the recent discoveries (in pictures and casts) from the British Museum-sponsored excavations at the site of Hierakonpolis, a major site of the formative predynastic period. Findings there are helping to chart the development of some of the characteristics that came to typify ancient Egyptian civilisation. Current research at other early sites also feature, thanks to the cooperation of many colleagues, too numerous to name, who so kindly supplied information and photographs, often at short notice. Through the display, I hope visitors will gain a better understanding of Egypt at its origin – a fascinating laboratory of dynamic experimentation – and the debt that the Egyptians of later times owed to their early ancestors. A recent book, Regarding the Dead: Human Remains in the British Museum, discusses the ethical and practical issues associated with caring for human remains and presents some of the solutions the British Museum has sought to curation, storage, access and display.